Major Moharkar Prafulla Ambadas (32) of Maharashtra, Lance Naik Gurmail Singh (34) and Lance Naik Kuldeep Singh (30) of Punjab, and Sepoy Pargat Singh (30) of Haryana were killed in firing. 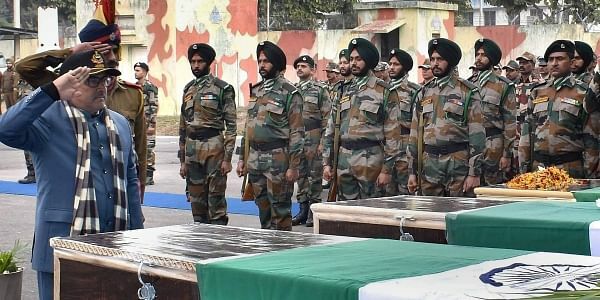 JAMMU: The Army today bid farewell to four soldiers who were killed in yesterday's ceasefire violation in Rajouri district of Jammu and Kashmir. General Officer Commanding of White Knight Corps Lt Gen Saranjeet Singh laid wreaths at a military send-off in Jammu which was attended by senior Army officers, police officers and other ranks, a defence spokesperson said. Deputy Chief Minister Nirmal Singh, Speaker of Legislative Assembly Kavinder Gupta and some other ministers of the state also attended the ceremony and paid tributes to the slain soldiers, he said. Lt Gen Saranjeet Singh said the soldiers' sacrifice would motivate the future generations. "The nation will remain forever indebted for the supreme sacrifice and devotion to duty of our heroes," he said. A separate ceremony was held in Udhampur where GOC-in-C northern command Lt Gen D Anbu laid the wreaths, the spokesman said. Major Moharkar Prafulla Ambadas (32) of Maharashtra, Lance Naik Gurmail Singh (34) and Lance Naik Kuldeep Singh (30) of Punjab, and Sepoy Pargat Singh (30) of Haryana were killed in a cross-border firing by Pakistani troops along the LoC in Keri sector.